Compton is a new school formed in 2017. 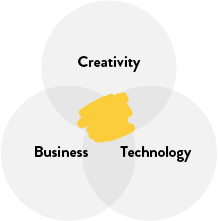 Our charter is to help people build viable creative businesses and lead sustainable creative lives. We’re the business school for creative people. By creative we mean not just the traditional arts but media, entertainment, music, design and communications. There have been changes too in the way people think about creative work. For this new generation, a new kind of school is required. One that understands the work they do and the opportunities they have.